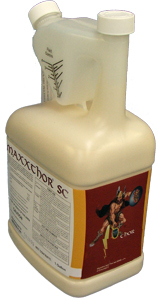 Maxxthor SC, in the form of a dilute insecticidal solution, prevents and controls subterranean termite infestations in and around structures and other items by creating a continuous chemically treated zone (horizontal and/or vertical as needed) between the wood and other cellulose material in the structure and termite colonies in the soil. In order to establish a barrier between the wood in the structure and the termites in the soil, adequately disperse the solution of this product in the soil. Maxxthor SC can also used to directly treat termite infested wood, however such treatments should be considered to be supplementary to, and not a replacement for, soil based applications of this product. To effectively control termites with this product, the service technician should be familiar with current termite control practices including trenching, rodding, sub-slab and void injection, soil surface fan spraying, excavated soil treatment and brush, spray and injection applications to wood. Correct use of these techniques is necessary to effectively control infestations by subterranean termites such as Coptotermes, Heterotermes, Reticulitermes and Zootermopsis. The service technician should consider the biology and behavior of the termite specie(s) to be controlled to determine which control practices to use. Active Ingredient: By Wt. Would you like to see the Maxxthor SC Label? How about the Maxxthor SC MSDS sheet?